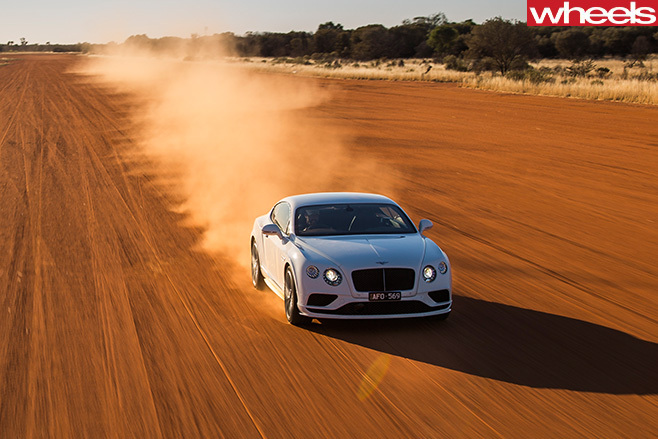 Late in 2014, Wheels took a Ford Falcon based FPV GT-F to an unrestricted stretch of the Stuart Highway in the Northern Territory. And we asked legendary race driver John Bowe to see how fast the FPV GT-F could go. Late last year, Pommie journo Ben Oliver thought he could do better than that. So he arranged for Bentley to lend him a Continental GT Speed. Oliver slipped into the driver’s seat of the Bentley on the same Northern Territory highway. And he forced himself to push the right pedal into the carpet for kilometre after kilometre. The result was a top speed reading of 329km/h and a cracker of a story about what it’s like to sustain that sort of speed on a public road in a road-car. It might have been legal, but Oliver did not find it comfortable. Even though Bowe was there again – sitting ice-cool in the passenger seat of the Bentley beside him. Bowe had previously maxed out the Continental himself, having been hired by Bentley to drive it for a video they produced of the event. He even got a bit more speed out of it. The Bentley video is good, with its voice-over from Bowe. But Oliver’s story is better. You can read it in the February 2016 issue of Wheels – the Car of the Year issue – on sale now.